They’re fluffy and cute but stop right there if you’re thinking about getting a pet bunny this spring. While bunnies can be great companions, they’re also pretty high-maintenance roommates. Before the Easter Bunny brings your family a new pet, make sure you know the basics to ensure the best care possible. Let’s get the lingo down first. Bunny is an informal term used for rabbits. Rabbits have long ears, furry bodies, a divided upper lip, and legs designed for jumping, just like a similar mammal – hares! Hares are larger than rabbits, but their biggest distinction is how they choose to pick their residence. Hares create nests with grass, while rabbits create burrows. While there are exceptions, hares are not typically domesticated. The animal that would be best suited for your home is a rabbit. 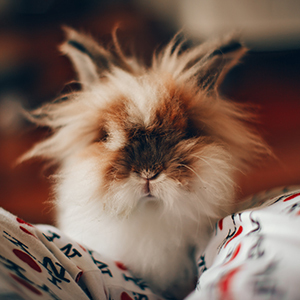 Rabbits are considered exotic pets, so make sure your vet has experience with bunnies. At Klein Animal Clinic, we have many rabbits that come for their care and can help keep your new pet healthy and happy. Bunnies need to be spayed or neutered to ensure more rabbits don’t arrive. Altering will also help with unwanted behaviors like marking. Prepare your home by keeping loose items off the ground and define a specific space to keep a paper-based litter box. They’re picky about where they sleep so make sure you have adequate housing. Rabbits minimum space should be four times their size, without a wire bottom. We recommend a pen or specific room for the bunny to roam. Provide them with soft bedding and a place to “hide” like a pet playhouse. Make sure you understand the food your specific breed of rabbit needs to stay nourished. Hay, pellets, vegetables, treats, supplements, and water are all part of a balanced diet. Bunnies are very social so create a schedule that includes daily play and multiple spaces in your home for your pet to explore. Rabbits can live for 8-12 years, so before finally bringing one home, make sure you’re ready for the commitment! Need more assistance researching for your new pet? Visit www.petrabbitcare.org for more detailed tips and give us a call at 563.441.7560. Already have a pet rabbit? Share photos of your furry friend on Facebook!